“It’s the best-kept secret in the real estate industry,” said Mark about becoming a loan signing agent. And I’m inclined to believe him. You can make $100 an hour as a part-time, and the only real requirements are that you know what you’re doing, and you have a notary license. 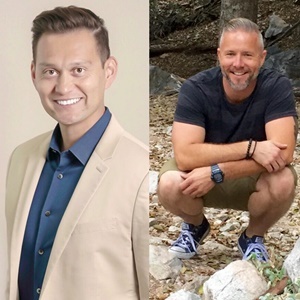 I was first introduced to this side hustle early last year, when I first sat down with Mark Wills and his business partner Roman Rosario. That conversation turned into episode 215 of the Side Hustle Show, where the pair walked me through how they built and sold an online course starting with no audience. At that time, the Loan Signing System course, which he teaches people how to become loan signing agents, was doing around $4k a month. A year and half later, and they’re doing around $30k a month and hosting a national conference! But what we didn’t really cover in that episode was how to become a loan signing agent and what that business is actually like — to the frustration of many listeners. So in response to audience feedback and several listener testimonials, I invited Mark back on the show, along with one of his successful students, to dive into the loan signing side hustle. Brian Schooley is a father of 5 who works full-time in tire sales, yet he’s bringing in $1500-2000 a month part-time as a loan signing agent. In need of some extra cash, Brian started working a weekend job, but the long hours and low pay were taking a toll. What are the Requirements and Startup Costs to Become a Loan Signing Agent? Knowledge of the various loan documents borrowers will be signing. If you have a background in real estate, you may already be familiar with the documents and contracts. If not, it might make sense to take a course like Loan Signing System. Mark acknowledged like any other skills, you can totally learn what you need to know on your own; he just offers a fast-track training. For his notary license, Brian paid a $69 application fee to the state (California) and took a $40 online course to help him pass the short certification test. Loan signing agents are also required to carry Errors and Omissions insurance, a policy Brian said set him back around $100 for the year. The low upfront investment was one of the factors that made this side hustle appealing to Brian, and he made back his investment very quickly. They call agents they have used before or have been recommended to them. They use a signing service and find agents by location and send out a text offering them the signing. Brian’s first signing was through the signing service. He received a text to sign off on a loan application and made his first $50 for an hour work. In those cases, the signing service handles the payment, so you receive the money by direct deposit. What’s the Loan Signing Agent Side Hustle Really Like? Brain said he got off to a slow start while he was getting his name out there, but hit his goal of $2000 in monthly income only a year after starting. He still works his full-time job from 7am-4:30pm, so he does all his signings in the evenings and on the weekends. Each gig pays $50-150 and rarely lasts more than an hour. You do need a reliable car to drive to your appointments, and while most signings are pretty straightforward, you never know who you’re going to meet. Brian described an interesting encounter with a buyer “way out in the desert,” but added it’s just par for the course in any side hustle that deals with the public. Mark added that a majority of signing agents are women and that buyers have gone through a pretty thorough loan application vetting process. In fact, it’s been such a fun and lucrative experience, Brian’s wife is getting started as a loan signing agent too! The easiest way to start getting signings is to add your name to as many signing services as possible. Mark described these directories like “Uber for signing agents” — they connect you with buyers pretty seamlessly. Brian has also grown his business by developing relationships with “suppliers” in the industry. Those are the loan officers, real estate agents, title agents, escrow officers, and others involved with the closing of home sales. “Every single one of us knows a real estate agent,” Mark said. Use those contacts to get your name out there. With this being such a lucrative side hustle and easy to get started with you’re right to wonder what the potential downsides are to being a signing agent. A question that Mark gets asked a lot is about market saturation. There is a fixed amount of loan signings per month, so adding more agents will only reduce the potential income. Mark says this isn’t really an issue because the industry caters to when customers can meet. Since everyone’s schedule varies, there’s room for more agents to fill those timeslots. Another potential downside is that it’s an on-call business. Brian might get a text at 4pm asking if he can make a 6pm signing. It can be tough to make plans in advance or have the discipline to turn down $150 for dinner with the family or whatever other evening obligations you have. Could it Be a Full-Time Business? I asked Brian if he thought he could take the signing business full-time, and he said yes. At one point he was tracking all the appointments he couldn’t make because of his day job, and was surprised by the volume of work that’s out there. Is this truly an option in all states? My sister is a real estate agent and she said that the lender and the title agent are the ones that do all of the paperwork. I just want to make sure this is something that there’s actually a market for in Nebraska before I pay money for a course. Fantasy in some states. Many title companies have in house people to close loans, or use long time trusted freelance people. Your E&O is going to cost a Hell of a lot more than a hundred a year in some states. You are going to be collecting payoff and escrow checks, and be responsible for their delivery on a timely basis to the appropriate recipients. A lot more than just notarizing docs and some closings can take several hours or more. Want pie? Go to a bakery. Not in the sky. And while you have listed some activities that are required of a signing agent, you have listed a number of exceptions, not the rule. 90% of my signings I personally do take less than an hour… are there some that last 1.5 hours or even more… yes. Because some people want every detail explained. But that’s not always the case. Collecting checks happens, but not often. And delivery on a timely basis is absolutely necessary… yet not sure if that’s necessarily a drawback. The more timely you are, the more signings you’ll get. So it’s not pie in the sky… no bakery needed. Just some good old-fashioned hard work and a great education on the subject matter! Thanks again for the message Adam! Hi Brian! Glad you’ve had a great experience with a well-trained loan signing agent! Thanks for listening to the podcast and for the comment! In Massachusetts, you cannot work as an independently contracted loan signing officer – you must be working directly under the attorney or lender. To do otherwise would be considered the unauthorized practice of law. Here is a list of state restrictions from the National Notary Association. Hi Rachel, great comment. And Massachusetts is certainly an attorney state where attorneys handle loan closings. And under certain circumstances, attorneys hire contracted signing agents when needed. And in attorney states, you can also do what are known as out of state signings where the signer resides or is visiting the state but the property is located in a non-attorney state. In that case, a contracted signing agent could be used. Here’s a blog with more information on attorney states! Thanks for listening and we appreciate the comment! Definitely sounds interesting, although in some states (like MA) you are required to be an attorney as well, or it’s illegal. So make sure you do your due-diligence first. Hi Sue! Absolutely and thank you for the comment. You’re right… do your due diligence, be sure signing agents are used regularly in your state, and always follow your local laws and best practices! Thanks again and I hope the blog helps add to your comment! I was living in one city and selling a property located in another city. A loan signer met me at my residence and the whole job was completed in an hour or less. At that time I remember wondering how she got that gig! Great observation Debbie! And she probably got the job by getting a text message asking if she was available! It’s pretty easy! Thanks for listening and appreciate the comment! What are the rules in the state of Florida, can I do this gig there without working under someone in real estate or having an attorney’s license? Hi there! I have a number of successful signing agents in Florida! As a notary signing agent, you’re an independent contractor so you don’t work under anyone… you work for yourself! And you can get started with just a notary commission! Be sure to click the links in the Side Hustle Nation post above to learn more! Just curious if this is viable in areas that use e-sign docs. My wife is a Realtor and everything she does is with e-signature. Would this be more for the actual closing docs with the title company? What are the odds of success in rural, small population areas? This seems like a great program but is it worth pursuing if there is not enough population to support this side hustle? I live in a city of 11,000 and there are approximately 150,000 people within 30 miles. Is this a big enough population base to consider following through with? Thanks. Hello. I am a notary, and completed a loan signing agent course online as well. How do I find/apply/submit my name to signing agencies? Join notaryreviews.org and Facebook group Notary Reviews. We provide members to our website with a genuine list of hiring companies who have been reviewed and rated by nsas. I’ve taken the course and was disappointed. I’ve in this business for 12 years and decided to take his course in May of 2018 to see if his marketing techniques could provide me something new…it was a one page list of a bunch of links. The course is overly priced and includes videos that are free on YouTube. Course also taught what a notary signing agent does not due, and could get them into legal trouble. He refunded my money after I gave it a review on my fb group. Notary2pro, Bill Soroka and Laura Biewer, better alternatives, and price is right for your budget. You forgot to mention the time spent faxing docs back. Also cost of laser printers, toner ink, paper, and broadband internet.